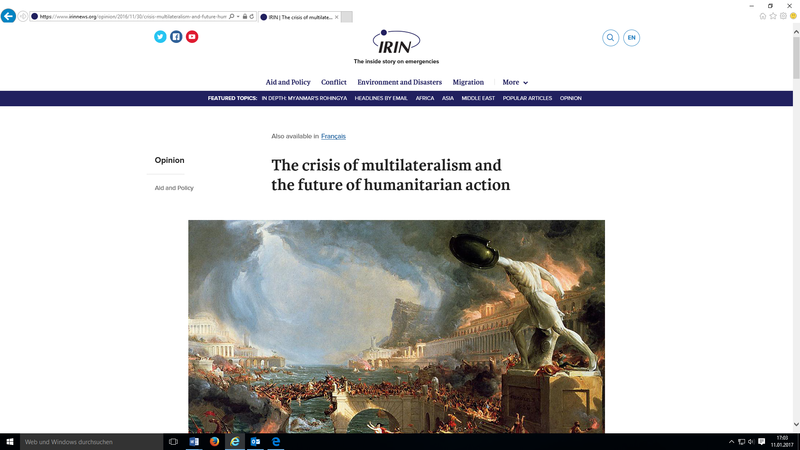 Regarding recent developments in international politics Antonio Donini has published an interesting piece on the crisis of multilateralism and the consequences for humanitarian action on Integrated Regional Information Networks (IRIN). Antonio Donini is Research Associate at the Geneva Graduate Institute’s Programme for the Study of Global Migration and also senior researcher at the Feinstein International Center at Tufts University. He has worked for 26 years in the United Nations in research, evaluation, and humanitar­ian capacities. His last post was as Director of the UN Office for the Coordination of Humanitarian Assistance to Afghanistan (1999-2002). This entry was posted in Actualités / News, Articles and tagged Humanitarian Action, Humanitarianism, Mulitlaterialism by Fabian Klose. Bookmark the permalink.